Right now I feel like I’m tickled by life. I’m buzzing with ideas, renewed inspiration and happiness. YAY! So I thought I’d share a few of the things that are making me happy right now. Are the leg warmers on my girlfriend’s daughter not the most adorable things you’ve ever seen? 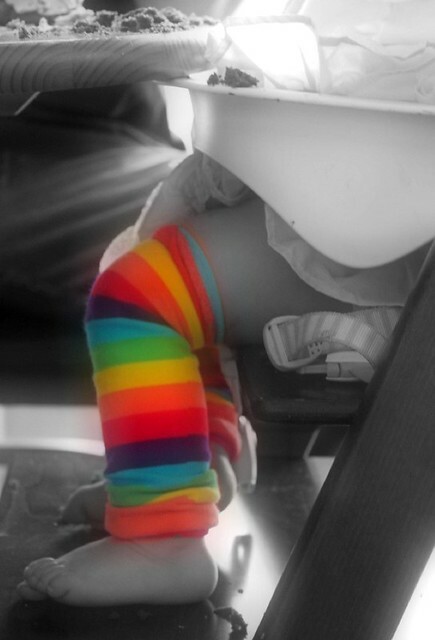 I snapped a few pics at Special K’s birthday party last month and have been in absolute love with her cute little legs in these rainbow leg warmers ever since. I remember having leg warmers in every color when I was kid and to see them on someone as tiny as K just tickles me to no end. Adorable AND a cute accessory. I have been crazy busy at work lately but I took a longer lunch break last week on the peak day of the Cherry Blossoms and snapped just a few pics. I think because of the cold temps the blossoms aren’t as pink as they normally are but they were still beautiful and mesmerizing. Oh and totally worth all the tourist I had to navigate through. This Acme Made iPad sleeve I was sent a few weeks ago hasn’t left my beloved Pierre’s side. A review and pics to come soon. On Sunday I made Dr. Pepper shredded pork and I think this must be the most beautiful piece of meat I’ve cooked yet. Cooking makes me so happy, I really should do it more often than I do. I watched Oprah’s Master Class featuring Oprah, it was a 2 part series and it totally inspired and renewed my faith in myself. I know that sounds weird but I tend to want to help others and never really think about helping myself. The thing she said that struck me the most was, “”What you believe has more power than what you dream or wish or hope for. You become what you believe.” I think this has become my new mantra. I may need to get this tattooed on myself somewhere so that I don’t forget it. If you haven’t watched her Master Class dvr or ON DEMAND it because it was truly inspiring. That’s what’s delighting me at this very moment. What’s on your list? She is absolutely adorable. Love those leg warmers! I wonder if they make them in adult sizes if they would be as cute. I do love me some Special K legs! And those feet are sweet enough to eat. Thanks for featuring the leg warmers, they totally take me back to the 80s and I loved me some leg warmers!! Those little feet are so sweet. It reminds me of my daughter, they grow up too fast! Sigh…I need a little girl. I don’t think Brooks would appreciate me putting those on him. Little girls are the best to dress, the clothes are just too adorable. And thanks for stumbling upon my blog, I hope you’ll stick around!